... well, about 10am, Eastern. But it's also Adventure Time! Cryptozoic has released the Adventure Time Card Wars Collector Pack number 5: Lemongrab vs. Gunter. 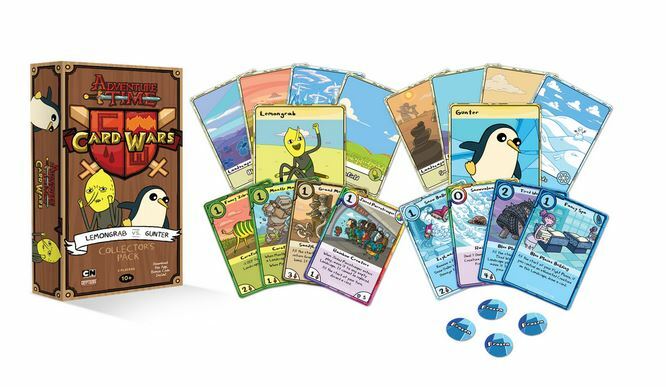 Playable right out of the box for head-to-head battles or used to augment your other Card Wars decks, the cards inside bring new strategies to the tabletop. Lemongrab's cards focus on putting bad monsters out on your opponent's side, taking up space and just generally getting in the way of whatever strategy your opponent was going for. Meanwhile, Gunter is all about keeping cool (as you'd expect from a penguin), letting you put icy lakes out onto the board.